God, I love this set. I love Innistrad for its flavour and its aesthetics, and also because it sort of represents the reality I understood of the world growing up. Trust the masters, trust the pastors, because they know what’s going on. Outside is dark, outside is lonely, do not go outside, do not risk the night. And they will make you one of them. Heartless Summoning is obviously bad with 1/1s or 2/2s. Partial credit for some Evoke cards like Shriekmaw and Mournwhelk (tried that, in case you were wondering). But look at Rune-Scarred Demon under a summoning: 5 mana, 5/5 flier, get a card. Or if you look at 5 mana creatures that still look impressive under a summoning, check out Archfiend of Ifnir, Bloodgift Demon, Ravenous Demon, Prowling Pangolin, Shadowborn Demon, Razormane Masticore, Spiritmonger, The Scorpion God, and Boltwing Marauder. I really like Heartless Summoning and no, these decks are never good. It’s funny going back over this block and realising just how much of the spine of Modern, the format, exists here. Even if it’s not specifically from Innistrad, this set is full of cards that you have to bear in mind when you build decks, like Lingering Souls and Faithless Looting. Yeah, I’ve played with them – a bit – but they’re more like reliable staples. 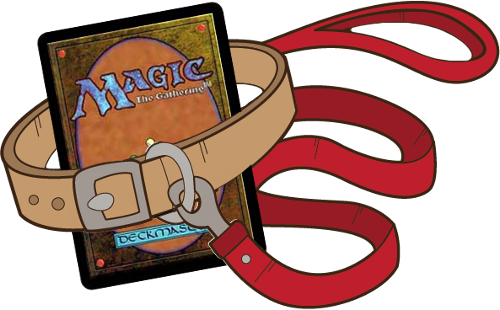 There’s a cycle of tribal lords (and I played with Drogskol Captain quite a bit in a blue-white skies deck that I remember fondly), and there is Avacyn’s Collar – the symbol of Avacyn’s church. 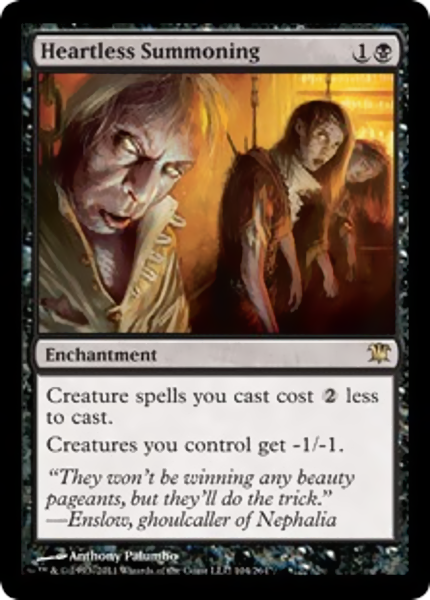 There is also Grafdigger’s Cage, one of those cards I hate the most in all of Magic, because it’s such a simple, oblative and cheap solution to the strategies it’s meant to fight and it fights them in such a boring way. It doesn’t even kill those strategies at the top level, it just makes casual graveyard decks miserable. Booo. Why is it one of my pet cards? If the above didn’t tip you off, I like graveyard strategies. I like playing with cards that come back from the dead. White gets cards that interact with this juuuust commonly enough to remind you that white can muck around in the graveyard. 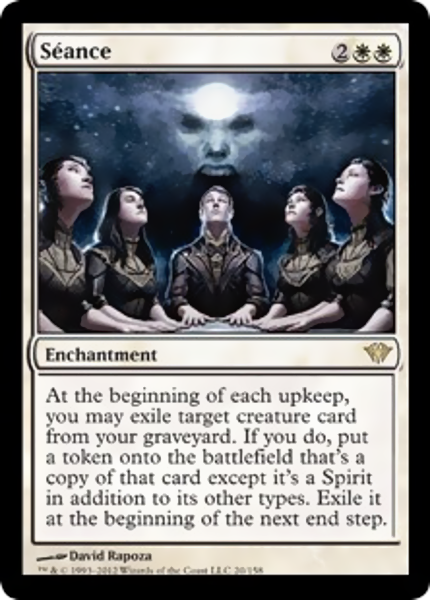 Thanks to Populate, white can even do things to keep the Seance tokens around! The most obvious card to mention from Avacyn Restored, certainly in terms of time I’ve played it is Ghostly Flicker, or maybe I’ll bring up the Soulbond options of Deadeye Navigator (overdone) or Tandem Lookout (hipster, underground) or Wingcrafter (the flyingest men of flying men). While I’ve certainly played with them – I mean, you can look up other decks I’ve mentioned on this very blog, they’re hardly pet cards. Same with Blood Artist (which probably is just too good). I’ve absolutely played with Harvester of Souls and Soul of the Harvest a lot, and special shoutout to Maalfeld Twins for making a good Scarab God token cover. Craterhoof Behemoth? You’ve heard of it. Zealous Conscripts? Core to a modern win condition. All the legends are good, too. For a time there I really liked Lightning Mauler because I saw it as a pseudo-Fires of Yavimaya, launching 3 drops into hasty spaces and then DYING, but it didn’t work as well as you might imagine. There’s a LOT of good stuff in this set. Surprise! It’s a utility removal creature! God, how expensive does an exile have to be that I’ll still play it? Apparently, nine mana. 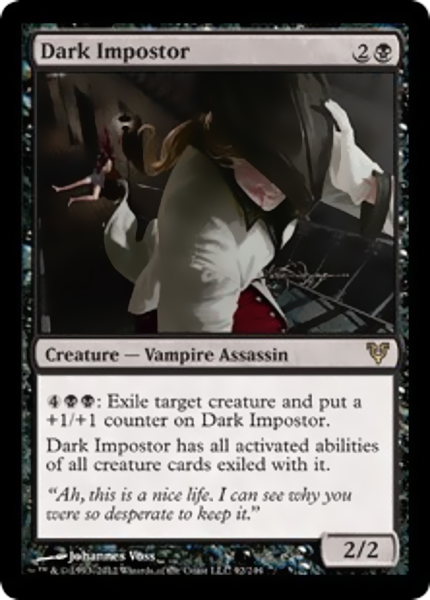 Dark Imposter gets to eat your opponents’ creatures, which is cool, but also it gets to take their special abilities. Normally, spending six mana to kill a small, utility creature is a super drag, but in this case it’s exciting because now those creatures are your creatures. Oh, and it’s a Vampire, because there aren’t any good tribal synergies there, are there?